Such a good word but so hard to explain properly. She used it to mean that something you were wearing was basically drowning you, making you look drab, dowdy and mousey. 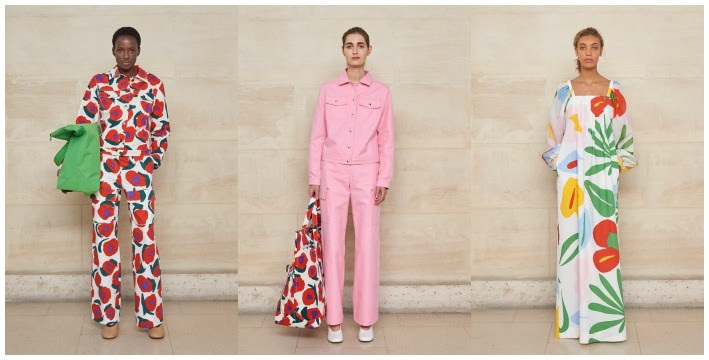 Now you could never apply the word drab to a Marimekko print but that length? 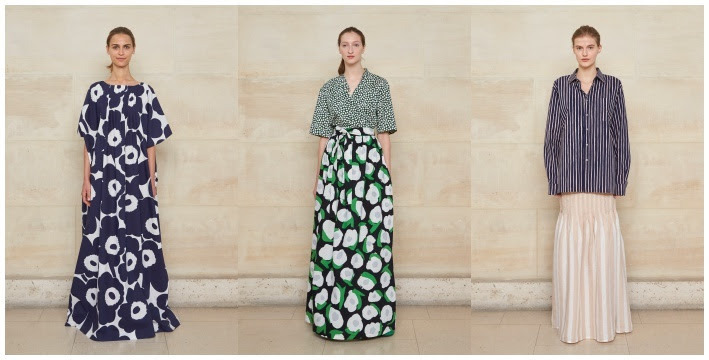 The spring/summer 2019 collection celebrates the original idea of Marimekko – meaning 'a dress for Mary' – with focus on archive-inspired liberating and romantic summer dresses. More than six decades after Marimekko’s founding, the story of the dress, reflecting the spirit of the time, continues to encourage women around the world to boldly express their personality through their choice of attire. The modern silhouettes of the collection have been skilfully paired with Marimekko’s renowned floral patterns, highlighting the design house’s art of print making. New organic prints create a playful dialogue with distinctive and graphical archival patterns designed between the 1950s and the 1970s. The season’s colour palette combines grass green with bright red, and monochrome pieces provide a peaceful contrast to the blooming prints. Most of the patterned woven fabrics in the collection have been printed at Marimekko’s in-house factory in Helsinki, where around a million metres of fabric are printed every year. The printing mill serves both as a factory and as an innovative hub for Marimekko’s creative community. I hate to be accused of practicality but in all truth how the hell would you keep a dress this length clean in Glasgow? I run around dodging puddles and mud every day.